Fenwei Coal Weekly Update summarizes the coal prices at home and abroad, operating rates of upstream and downstream companies, stocks, coal supply & demand, and imports & exports, the data of main ports and downstream industries; analyzes the changes of coal market in the week and the reasons in terms of coal market news & events, hot topics, policy interpretation, data analysis, etc; and provides market outlook and price forecast. 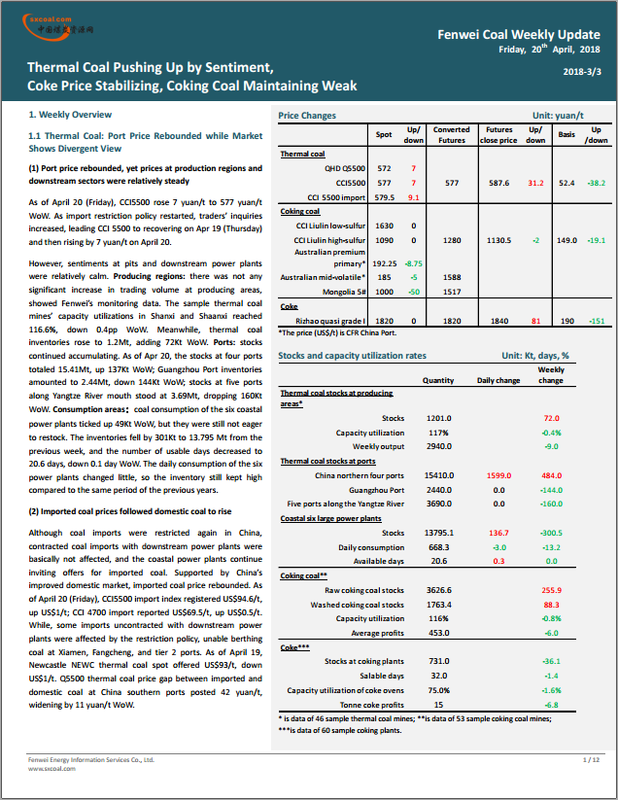 Our Weekly Update presents you an informative picture of the coal and coal-related markets of China and the world. 2.1 Domestic news: following up and analyzing the breaking news & events on macro economy, industry and related companies involving power, thermal coal, iron & steel, coke and coking coal markets. 2.2 International news: following up and analyzing the latest news & events on international coal market, investment, industry and related companies.